The same brother who conducted my investigation was clear to tell me that everyone hopes that the master will continue building and running the lodge in the way our forbears did, but that there are no guarantees. This is a dictatorship, not a democracy. What we hope the master will do is take the advice of the members and officers, and seek wise counsel from his colleagues and those who have come before, but he is not obligated to do this beyond what his conscience dictates. The master is the head of his lodge. What he says effectively becomes the law, as long as it is otherwise Masonically legal. He is also in charge of the lodge’s money and can order various expenses paid. That is a lot of power to put in one person’s hands, and although technically the master is above questioning, even Solomon the Wise had good and trusty assistants and advisors who would whisper good counsel in his ear. I know of a case in which the Master of a lodge decided that he wanted to have a special event for his officers so they could bond more and thus work together better, so he bought the line officers a weekend in Las Vegas. Was that within his power? Yep. Was it responsible? No way. Future years of leadership struggled quite a bit to right that ship. This action went against the general guidance that the Master is to be a good steward of the lodge’s property and money, but it was technically within his power to do this. In another lodge, a master ordered an expense paid and the treasurer refused to pay it on the grounds that it was frivolous and had nothing to do with the good of the lodge or Masonry as a whole. In this case, the treasurer was out of line by refusing to obey a lawful order, but he was acting in the best interests of the lodge. There were no Masonic charges levied, thank goodness, but I fear what such action might have resulted in. The treasurer was right to advocate for the lodge’s interests but the master was right in expecting his order to be followed. These are obviously conflicting interests. The worshipful master has the final say in all things, according to Masonic laws in every place I know of. However, that does not mean that the master is always right or is as wise as we would like someone in that position to be. Disagreements will happen in lodge about the validity of a ruling the master makes. In these cases, we need to respect the station and avoid personal piques and quarrels. However, we also need to look out for the best interest of the lodge and know when to stand up and challenge authority in a respectful yet firm manner. However, before you go challenging the master, ask yourself why you want to do it. If this is about the $100 donation to the food bank that you think should be given instead to the homeless shelter, maybe you should bite your tongue. If it is about the trip to Las Vegas the master is planning as an officer’s retreat, definitely stand up and say something. As a member of the lodge, you should have a say in how the lodge’s money is spent. The master should entertain discussion in all large expenses, but that is a best practice, not a rule. We live in a dictatorship when we are in lodge, for good or bad. The way to curtail negative or foolish actions is to elect someone you think would not act like that. The same is true in business. It is a whole lot easier to not hire someone than it is to fire that person. 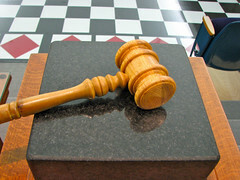 Worshipful Master’s Gavel by mrbill, on Flickr. This article is so incorrect that I first thought it was a satire. Masonry is not a dictatorship and the Master is not a dictator. Freemasonry is one of the oldest examples of a democracy in which the membership votes on everything and elects the officers by secret ballot. Hi Casey. In terms of electing members, you are correct. However, in terms of what happens in lodge, at least in my grand jurisdiction, the control of the lodge is given to the master. Yours may be different. As a matter of course and in the interest of harmony in the lodge, the master should solicit the members’ opinions on a number of things but he has no obligation to. Carl makes a very good point. Our outgoing WM has always asked for his fellow brothers opinion when it came to matters of the Lodge. However, a few years back there was a WM who did not care what we thought. As customary, we call off for July and August and resume regulars in September. This particular WM refused to allow it when brought up for vote. He wanted to continue meeting so no one would “lose interest” and not return. By doing so, most Brothers did not attend out of spite. A WM like that is poisonious to the harmony of the Lodge. Bro. Matt, That is quite unfortunate. You are right – poison and harmony are both options when running the lodge. We always hope for harmony but sometimes we get the other. Glad those days are over at your lodge!